The image that accompanied the "Mars Spectacular" email of 2003, which sparked the recurring Mars Hoax. The infamous Mars Hoax that has circulated widely through the Internet since its first appearance in 2003, when it originated in the form of an email message titled "Mars Spectacular," has reared its ugly head yet again. "The encounter will culminate on Aug. 27 when Mars comes to within 34,649,589 miles (55,763,108 kilometers) of Earth and will be (next to the moon) the brightest object in the night sky. It will attain a magnitude of -2.9 and will appear 25.11 arc seconds wide. 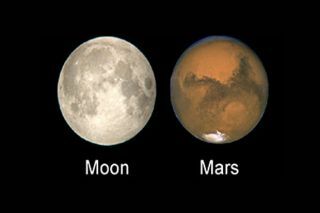 At a modest 75-power magnification, Mars will look as large as the full moon to the naked eye. Mars will be easy to spot." Many people, it seems, glossed over the words, "At a modest 75-power magnification" — partly because the email featured a line break just after this phrase — and fixated solely on "Mars will look as large as the full moon to the naked eye" (without realizing a telescope would be needed to pull of this trick). And ever since, it has been all but impossible to get the proverbial genie back in the bottle. The "Mars Spectacular" message was meant to apply only to August 2003, although every year since, during the month of August, the message has resurfaced and has propagated through cyberspace on to many other unsuspecting individuals. It amazes me that the hoax keeps drawing people in 12 years after it first emerged. Back on Aug. 27, 2007, one of nature's great sky shows, a total eclipse of the moon, occurred across the United States. On the day before the eclipse, the people who run the "answer line" at New York City's Hayden Planetarium expected a heavy volume of phone inquiries from the general public concerning advice on how to view the eclipse. Fifty-one calls were logged that day, but amazingly, only three concerned the upcoming eclipse; the other 48 were calls asking about how to see Mars when it was due to appear as large as the full moon! Interestingly, most of the original email message is substantially correct (for 2003). But there were also a few inaccuracies. For instance, after 2003, the next time that Mars will come closer to Earth will be in 2287, not 60,000 years from now. (The message confusingly implies that both of those figures are accurate.) And the 2003 rendezvous marked the closest Mars had come to Earth in more than 59,000 years, not merely 5,000 years. Furthermore, in 2003, Mars was not the brightest object in the night sky other than the moon. That honor went to Venus. In fact, even at its very brightest, Mars was a full magnitude fainterthan Venus. And even at its brightest, Mars appeared to the naked eye as nothing more than an extremely bright, yellowish-orange star, not at all like the full moon! So if you have already received this infamous Mars email, or if you receive it in the coming days, delete it! In fact, why not take a few moments and forward this column to all those in your address book? Think of it as an antidote to the Mars Hoax virus. So where is Mars now? This month, Mars is much dimmer and far less conspicuous than it was in August 2003. The Red Planet is 239 million miles (385 million km) from Earth, nearly seven times farther away than it was a dozen years ago. And at magnitude +1.7, Mars is about 70 times fainter compared to 2003, so you actually might need binoculars to pick up the planet in the twilight sky. Currently, Mars is very slowly becoming evident in the dawn sky. It is rising 90 minutes before the sun. Search in the east-northeast sky, below the stars Castor and Pollux in Gemini. In terms of actual size, Mars is almost twice as big as the moon — about 4,213 miles (6,780 km) in diameter, compared to 2,160 miles (3,475 km) for the moon. But the great distance between Mars and Earth means that the Red Planet never appears anywhere near as large as the moon in Earth's sky. The average distance of the moon from Earth is 238,000 miles (382,900 km). For Mars to appear to loom as large as the moon does from Earth, it would have to be a mere two Earth-moon distances away, or roughly 476,000 miles (766,000 km).